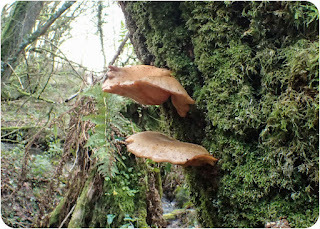 Carmarthenshire Fungi: Are things what they seem? The most frustrating thing about looking for fungi is that even when your convinced you know something, you are usually wrong. 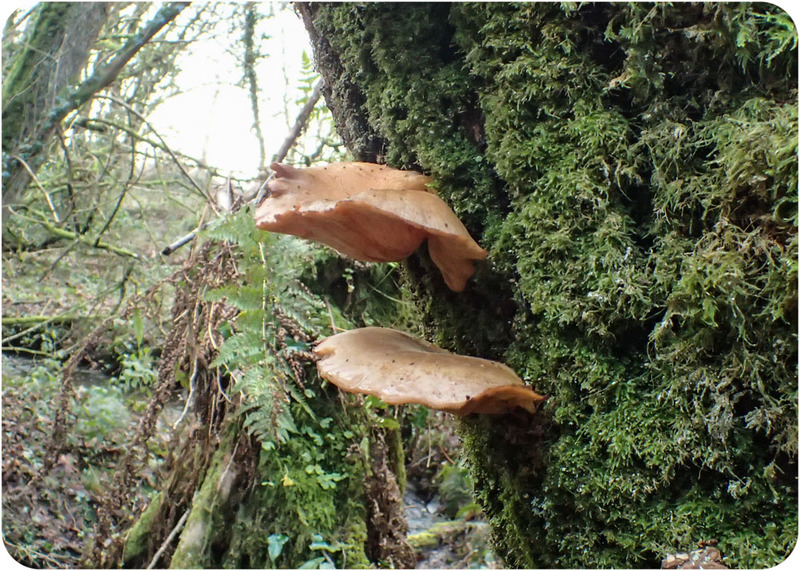 These were in a large tiered group on an old willow tree near Furnace ponds. They measured about 9 cms across and, because of the size and the time of year, I assumed they must be Oyster mushroom, Pleurotus ostreatus. 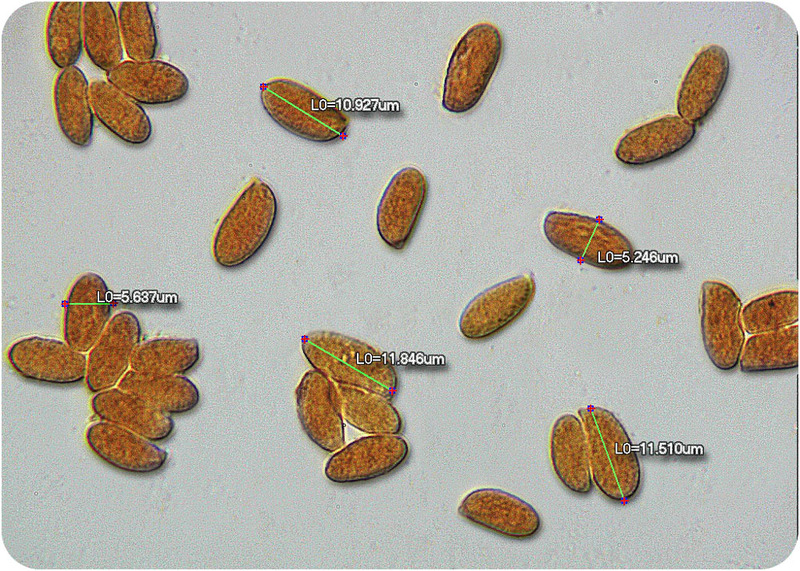 When I took one home however the spores were completely the wrong size and shape and besides that, they darkened in Meltzer's (amyloid), whereas Pleurotus spores are inamyloid. 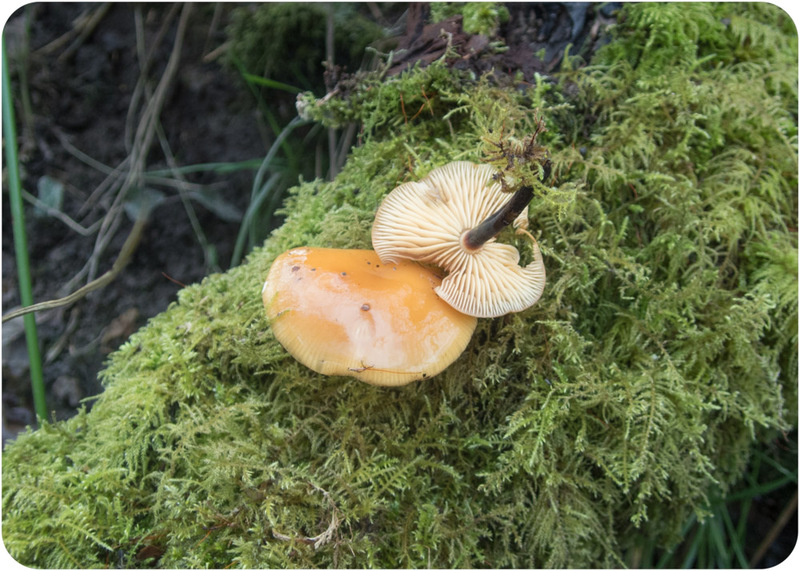 I put my dilemma on the UK Fungi website and the concensus of opinion was that they were Olive oysterling, Panellus serotinus. Which I have found before on a number of occasions and it has always been ~ 3-5 cms across and distinctively olive in colour - all very confusing! Velvet shank, Flammulina velupites, is quite common at this time of year and can form large groups so you can hardly miss them. These below were growing on willow. Again I took some home for a look at the spores and again they were the wrong size. They were much larger, with a bigger length/width ratio. I found some like this last year as well and it would appear that there is another Flammulina species, Flammulina elastica, which has these characteristics. There are only a few records but that, so I am told, is not because it is rare but because everyone assumes it is the common one. And at this time of year there is the ongoing conundrum of whether it is a Scarlet or Ruby Elfcup. When you go bird-watching, if it is a blackbird with a white ring around its neck then it is a Ring Ouzel - it's a pity the same doesn't go for fungi! At least fungi don't fly off just when in focus --- if they've gone they've gone. 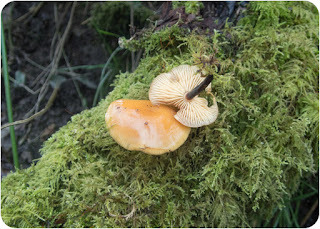 Emily posted P.serotinus on 8th Jan Blog, found 24th Nov. This is the usual size and colour so interesting that these were so large. I think Tony had this problem with Flammulina then learnt of the two species. I must look out a Field Mycol mag discussing the two. Do you do microscopy each time you find something that looks as if it is F.velutipes (?) --- I don't!